You can guess how old the Black-Banded Leporinus is by counting its black stripes! The Banded Leporinus Leporinus fasciatus is undoubtedly the most popular and brightly colored of this group of fish. Its alternating bands of black and yellow are very striking and really make this fish stand out. It is also very large, usually reaching 12 inches (30 cm) in the length in the wild, though in captivity they generally reach only about about 8 inches (20 cm). The size and bold, banded pattern of the Banded Leporinus makes it a very attractive fish in the aquarium. The scientific name of this characin is curious yet descriptive: Leporinus means "rabbit snout" and fasciatus means "banded." The common names Black-Banded Leporinus and Banded Leporinus also describe its body pattern. The most interesting thing about the patterning of this fish is that as a youngster, it only has 5 black bands. After it is a year old, the first of these bands splits, dividing into 2 bands. Every 6 months after that, another band will split into two. By the time this characin is 3 years old, it will have 10 bands, and its yellow-colored band turn more orangish. You can actually determine the approximate age of this fish by counting its bands. The Black-Banded Leporinus is a good community fish, but it is very active and should be kept in a large aquarium. Keep the aquarium covered as they are very good jumpers, and can jump long distances. Even though they are usually peaceful, they can be fin nibblers, so choose their tankmates carefully. We have kept them with a wide variety of community fish as well as small cichlids. An aquarium well suited for this fish has a sandy bottom with pieces of wood and rocks. As long as there is algae growing on the wood and rocks, the Black-Banded Leporinus will swim in a head down position, constantly grazing. If there is no algae, it will nibble on the shoots and leaves of plants. Nice video of a well stocked aquarium including two Banded Leporinus. The Banded Leporinus Leporinus fasciatus was described by Bloch in 1794. This species is not listed on the IUCN Red List. They are found in Central South America in Amazon tributaries from Guianas to the La Plata. Another common name they are known by is Black-Banded Leporinus. These fish inhabit fast moving rocky waters and will migrate into flooded forest areas during the rainy season. When the water recedes, some of the fish are left inland in ponds and lakes. They feed on algae, plant matter, worms, crustaceans, and occasionally fish. Social Grouping: Varies - Solitary or in groups. The Banded Leporinus has an elongated, heavy body with an arched back and narrower tail. This fish reaches 12 inches (30 cm) in the length in the wild, but in captivity grows to about 8 inches (20 cm) and has a life span of 7 to 10 years. A series of dark and light bands run along the entire length of its body from the snout to the caudal penduncle. Its fins are transparent, sometimes with a black hue. Juveniles have 5 black bands, and at 1 year of age, the first of these bands splits, dividing into 2 bands. Every 6 months after, another band will split into 2. By the time this characin is 3 years old, it will have 10 bands and its yellow bands will turn orangish. Size of fish - inches: 12.0 inches (30.48 cm) - These fish get up to about 8 inches (20 cm) in captivity, though they have been known to reach 12 inches (30 cm) in their natural habitat. Lifespan: 10 years - They have a lifespan of 7 - 10 years. 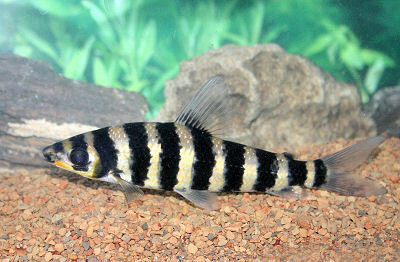 The Black-Banded Leporinus is a fairly hardy fish and a good choice for an aquarist with some fish keeping experience. They adapt well to slight water condition changes and are easy to feed. They can be destructive in aquariums, however, and their large size makes them an undesirable choice for beginners. These characins should be kept in a tank at least 60 inches long and ideally 50 or more gallons for a single fish. The tank also should be securely covered as these fish are skilled jumpers and will probably do so if given the opportunity. In the wild, the Banded Leporinus feed on algae, plant matter, worms, crustaceans, and occasionally fish. These fish are omnivores, but they prefer vegetables to all else. They will generally eat a vegetable flake when they are small but as adults will appreciate plant matter. Feed a good spirulina formula fish food or algae wafers and other vegetable matter such as chickweed, watercress, crushed lettuce leaves, and spinach leaves. They will also nibble on the soft shoots and leaves of aquarium plants. Offering some crushed lettuce as a substitute can help. Diet Type: Omnivore - Although omnivorous, they prefer plant-based foods and will nibble on most aquarium plants. Banded Leporinus are not exceptionally difficult to care for provided their water is kept clean. At least 25 to 50% of the tank water should be replaced every other week, especially if the tank is densely stocked. Take great care not to clean too much algae from the tank as it is a food source for this fish. These fish can be kept singly or in groups of 6 or more. They do get pretty big and will need at least a 50 gallon aquarium for a single specimen, and much larger for a group. Ideally, provide a tank at least 60 inches long or more. They like some planted areas but may tend to snack on them once they've eaten any algae they can find. Algae growth should be encouraged. Decor of twisted roots and driftwood will be easier to keep. The substrate should consist of sand with some large smooth rocks to encourage algae growth. Ensure that the tank is fitted with a tight cover, or this fish will jump out. Water flow should be fairly strong, and this can be accomplished with a river manifold system or multiple powerheads. Large canister filters will work best to keep the tank clean and well oxygenated. The canister filter will also aid in keeping a strong current. Water Region: Bottom - These fish will swim in the middle to lower part of the aquarium. The Black-Banded Leporinus is a good community fish. It is generally peaceful with other fish of a similar size or larger, but it has been known to nibble on the fins of others, and it will certainly snack on smaller fish. It can be aggressive with its own species, so it is best kept as a single species or in a group of 6 individuals or more. Good tankmates for this fish are similiarly sized characins, Loricariids, Doradids, peaceful Cichlids, and Knifefish. They can be destructive to plants in the aquarium, especially if they are not well fed. Same species - conspecifics: Yes - If kept with others of its own kind, have a group of 6 or more to avoid aggression. Slow Swimmers & Eaters (): Monitor - They have been known to nibble on the fins of others occasionally. Plants: Monitor - They will eat algae from surfaces. Once the algae is gone, they will start nibbling on soft plants. Providing a crushed lettuce substitute can help. Adult females are rounder-bellied than males. The Black-Banded Leporinus has not been successfully bred in captivity. In nature, they are reported to construct some form of nest which the male guards until the eggs hatch. For a general description of breeding characin fish, see Breeding Freshwater Fish: Characins. Ease of Breeding: Unknown - Instances of breeding are unknown in the home aquarium. As with most fish, Banded Leporinus are prone to skin flukes, parasitic infestations (protozoa, worms, etc. ), parasitic infestations (protozoa, worms, etc. ), bacterial infections (general), and bacterial disease. Banded Leporinus are extremely hardy and disease is not usually a problem in a well-maintained aquarium. However, they can still experience health problems or disease. Remember that anything you add to your tank can introduce disease. Not only other fish but plants, substrate, and decorations can harbor bacteria. Take great care and make sure to properly clean or quarantine anything that you add to an established tank so as not to upset the balance. A good thing about the Banded Leporinus is that due to their resilience, an outbreak of disease can often be limited to just one or a few fishes if dealt with at an early stage. When keeping more sensitive types of fish, it is common for all fishes to be infected before the first warning signs can be noticed. The best way to proactively prevent disease is to give your Banded Leporinus the proper environment and a balanced diet. The more closely their environment mimics their natural habitat, the less stress the fish will have, making them healthier and happier. Stressed fish are more likely to acquire disease. Aquarists should read up on common tank diseases. Knowing the signs and catching and treating them early makes a huge difference. For information about freshwater fish diseases and treatments, see Aquarium Fish Diseases and Treatments. The Banded Leporinus or Black-Banded Leporinus is readily available in pet stores and online. I have a beautiful Leporinus that has lived for over 15 years in a tank with clown loaches, ghost knife, cory's, Raphael catfish, Botia, parrot, severums, and I have never had any fish go missing including the baby clown loaches. He likes his wood cave(we have lots of wood for everyone to hide in)and doesn't like to share. He will chase them off, but he's never hurt or fin nipped any tank mates. I feed frozen meats( blood worms, brine shrimp) and plenty of veggies (spinach, cucumbers, green beans. I have a Leporinus that is about 8 to 10 inches and I am trying to find a good home, trying to get into African cichlid, need tank space. If anyone is interested on here please let me know. I'm interested :) Where are you from? How to collect and how will you deliver?